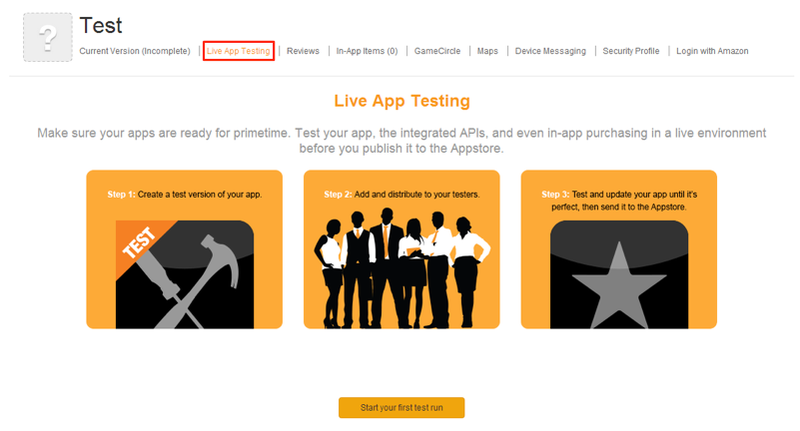 This page provides an introduction on how to use Amazon's Live App Testing service. Go to https://developer.amazon.com/myapps.html and click My Apps. Sign into your developer account. If you do not already have one yet, you can create one now. Select an existing app or click Add a New App. If you click Add a New App, go to step 3, otherwise, skip to step 4. After clicking Add a New App, select Android. Click Next and then fill out the New App Submission information. Click Live App Testing to set up a test for this app. 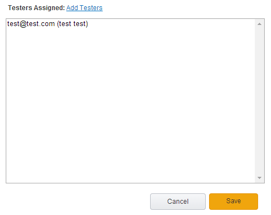 Once on the following page, click Start your first test run to begin the process of setting up your first test. Fill out all of the required tabs. In this step, you add the metadata and the APK that you want to test. Note: On the APK Files tab, make sure to check the EXPORT COMPLIANCE option. After you fill out each tab, you can either submit your app (without assigning testers) or go to the dashboard and add testers. If you are not ready to add testers at this time, you can click Submit to submit the app for publishing. This process can take up to a few hours. 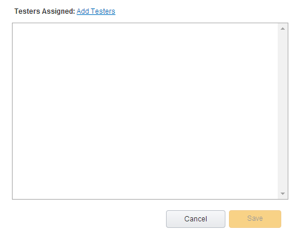 On the dashboard, click Add Testers to add testers to the test. On the testers page, click Add Testers. Either upload a list of tester email addresses, or add the testers individually. 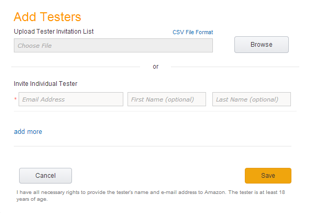 You can add yourself as a tester so that you get the invitation email as notification that the app is available to download and test. After you add the testers, click Save. After adding testers, select the gear icon, and then click Submit. You have completed the process. 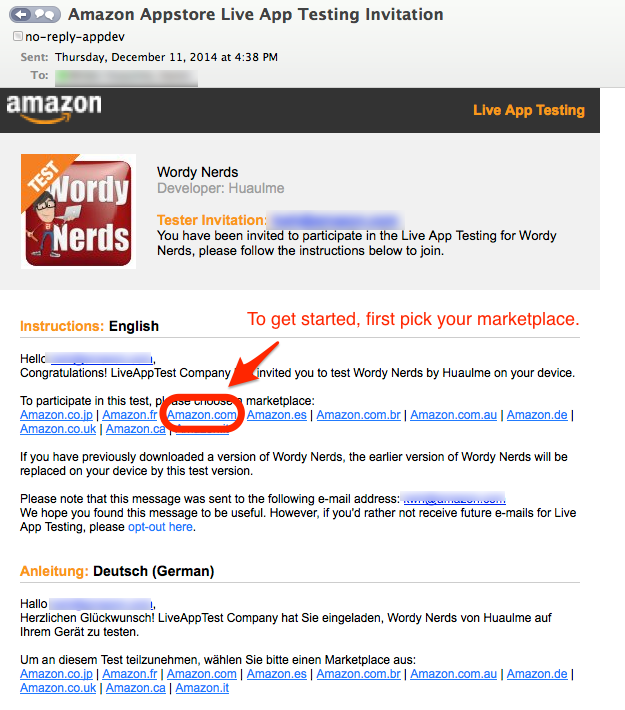 Testers will receive an email to join your test once the app is live. The email will contain a link to your app's test page with instructions on how to download and install your app on Fire and Android devices. Note: After submitting your app to Live App Testing, it can take up to several hours before your testers receive their email invitations. Important: When your testers receive their emails, if a specific device is not sold in their marketplace, that device does not appear under the registered devices on the Live App Testing retail page for the app. For example, because Amazon does not sell Fire TV in Italy, if you send a Live App Testing invitation for a Fire TV app to a user testing the Italian marketplace, when the user clicks through to the retail page for the app, the drop-down menu is replaced by a Continue button on the invitation. After your app is published and live, you can either end your test, or promote your test to an upcoming version. By promoting your app to an upcoming version, you can make finishing touches such as uploading final screenshots or metadata before going live. Tests that have ended appear on the Live App Testing dashboard under the Past Tests section. On the Live App Testing dashboard, you can also easily see the crashes that have occurred during the test. You can test new versions of published apps, by selecting your app in the Amazon Developer Console and clicking Live App Testing, at the top of the screen. The first time you create a test version of a published app, APKs and metadata are copied from the live version to create the test version. APKs and metadata can then be modified for the test, if necessary. Subsequent test versions are created by copying the APKs and metadata from the most recent test version of the app. Note: If you want to promote the test version of an app that already has a live/published version, the APKs in the test version must have version codes greater than or equal to those in the current live version. The link will open the retail page for the app in the specified marketplace. On the app retail page, from the Deliver To: drop-down menu, select the device where you want to install the app. Install the app to the specified device. 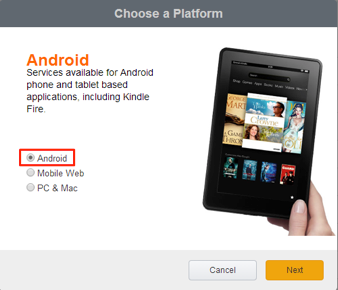 You can test on as many devices as you have associated with your Amazon account that the app targets. Note: If the test app contains any In-App Purchasing (IAP) items, the cost of those items will be reduced to zero cost to the tester at the time of the transaction. Navigate to your Live App Testing Dashboard page. From the Actions drop-down menu, select Promote to Upcoming. You will be required to fill out any missing metadata for your app, but you will not need to re-upload your APK. 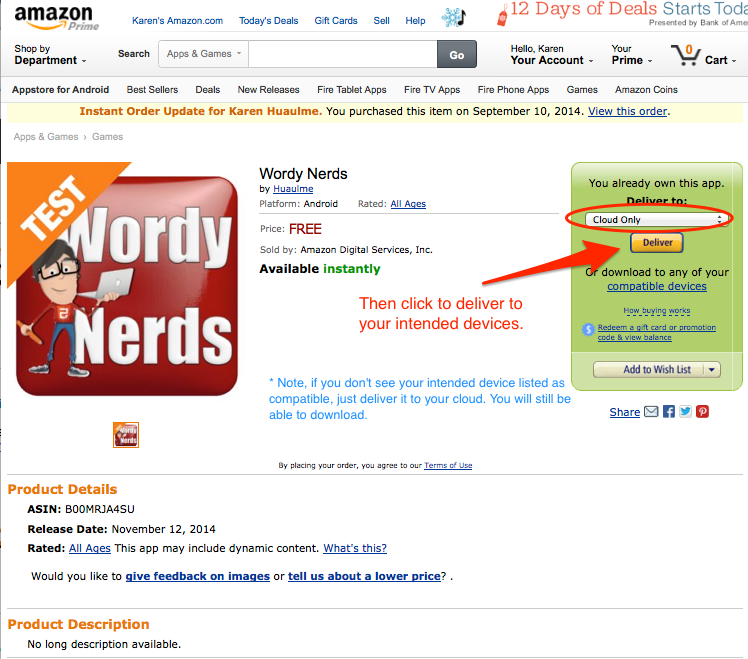 Amazon will email you when your app is live on the Amazon Appstore.